I visited your fine establishment on Saturday the 26th, at the recommendation of friend who boldly asserted that you guys made the best burgers anywhere. He wasn’t wrong. I enjoyed a bit of one at the end of our meal, and it was effing delicious. That said, a burger wasn’t actually what I ordered. As a longtime lover of grilled cheese sandwiches, I’ve recently made it my mission to scour the earth for the perfect grilled cheese. Adopting a simple 1-10 rating system, and a photoblog to chronicle the process – I’ve devoured many. When I saw one on your menu, I couldn’t help myself. I knew better, but alas. Knowing that burgers were your specialty, it should have come as no surprise when this dreadful thing showed up: hatefully constructed with a gaping hole, at least three slices of not-quite-melted American cheese, and all topped off with a sprinkling of grill droppings. Clearly, the kitchen staff does not take kindly to audacious patrons who snub your cheeseburgers. I really didn’t mean to hurt anyone’s feelings, and certainly mean no disrespect to local artist Michael Birawer, who allegedly endorses the thing. Now, I didn’t actually finish it, but I can say it’s possibly the worst grilled cheese sandwich I’ve ever been served – due largely to the obvious disdain with which it was prepared. (It scored a 2/10.) To your credit, the fries and burgers were, in fact, absolutely delicious. I’ve never even seen my friend Kate finish a whole cheeseburger. You’re probably wondering, “So, what’s your point?” I’m glad you asked. As a devoted grilled cheese enthusiast, I cannot stand idly by while an establishment with such obvious principles serves such a sub-par grilled cheese sandwich. What I’m asking is simple: approach it with the same fervor and gusto as you do your burgers. Use more than one kind of cheese, add some garlic, some bacon, make it with three slices of bread, for effs-sake! Or, I beg of you. 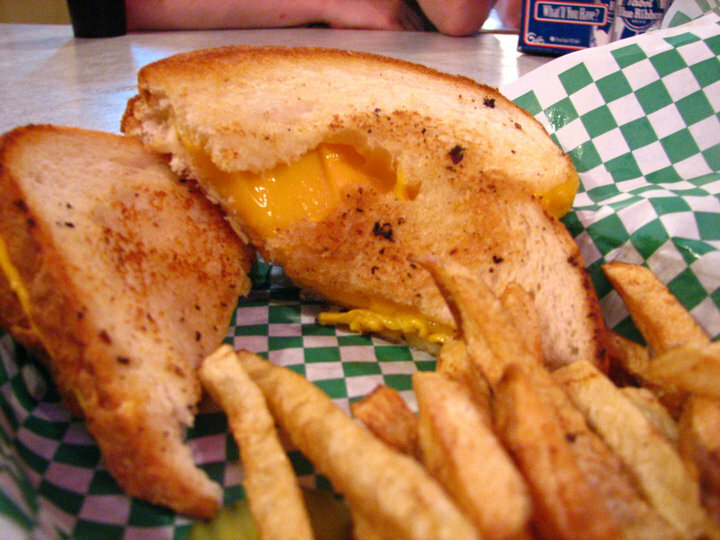 On behalf of grilled cheese lovers everywhere: remove it from your menu. Please.